This is not your average circus act. The trapeze mechanism was stationed in a high ceilinged strip mall off the interstate in Redding, Mass. As advertised on their website one could walk in on Saturdays for “open swing” for $10. The whole production consists of two platforms, adjacent to one another, that resembles blown up arcade pop-a-shot nets. The nets are located in a mall food court alongside a candy walkway, replete with a lollipop bridge and popcorn sign posts. The walkway paves the way to a stage area with serpentine fountains backlit by neon lights that shoot water in tandem to the scores from full-length Disney animated features. Couple this unsettling scene with my adventure cohort for the day and things are looking uncomfortable. Being excited and wanting to beef this up, I invited a date to attend. But not just any date – I invited a first date I met online. But I didn’t stop there; I also enlisted the participation of an energetic, fearless friend. For the purpose of foreshadowing what came of the date I should note that said friend is petite and beautiful and photographs well mid-flip. Let’s focus on the fact that she can flip. Perhaps I wasn’t making the wise choices. Securing my mother’s admiration meant little when I saw how high the bars were. Ms. Stephanie, the lovely friend, asked how high and was told that we’d swing from 30 feet. 30 feet! But because I was on a date, and because my ride in with said date (Billy) wasn’t half bad, I wanted to make a good impression. So I swallowed my fears and let an employee attach a harness to me. I then gripped the metal railing of the slatted stairwell on our slow ascent up. Surprisingly, without reticence, I took my turn at the top of the platform when prompted and gripped the bar. Now, know I have a nagging fear of heights. That fear bullies other neuroses. So much so that I find myself afraid of flight, of drops, dropping, drop sensations. The sum total of these persistent fears makes for some bad trapeze math. Still, I was freakishly mechanical in my approach to the whole thing. Billy had swung. Stephanie too, and both stood of the mats spotting the floor, 30 feet below, with cameras in hand. I wanted Billy to like me. I wanted someone to take notice, and I wanted these adventures to stop being so complicated and nerve inducing. While I can’t say I articulated these thoughts at the moment of release, I knew enough to just jump. It was as if some unknown will mechanically thrust me off the platform and I was airborn. When you trapeze swing your stomach lurches and you feel out of control – penanced to pendulum. I couldn’t nail the flip and fell flat on my stomach in a thick net suspended some six feet in the air. I wasn’t graceful or light or memorable. Instead I was clumsy and noticeably terrified. But I did jump without reservation and that was a first for me. I tried and disliked it, and stopped there. But Stephanie and Billy expanded their package to swing twice more. Billy, purportedly a novice, was poised and controlled. Every time the instructor shouted out a direction, “Swing forward, swing backward, swing forward, swing backward, tuck, release, flip!” he would follow procedure without error. His photo roll showcased an open mouthed grin and a body in complicated, yet pleasant angles. Stephanie followed suit, after some slight misdirection, and tucked and flipped with the best of them. Which left me a one trick pony splayed out on the mat. I could have left it at that and taken pride in the fact that I jumped of my own accord, but I am competitive and wanted to seem successful in front of Billy. Because of this foolish pride I enrolled myself in a two-hour course, three weeks from then. It was totally my way of postponing the inevitable. 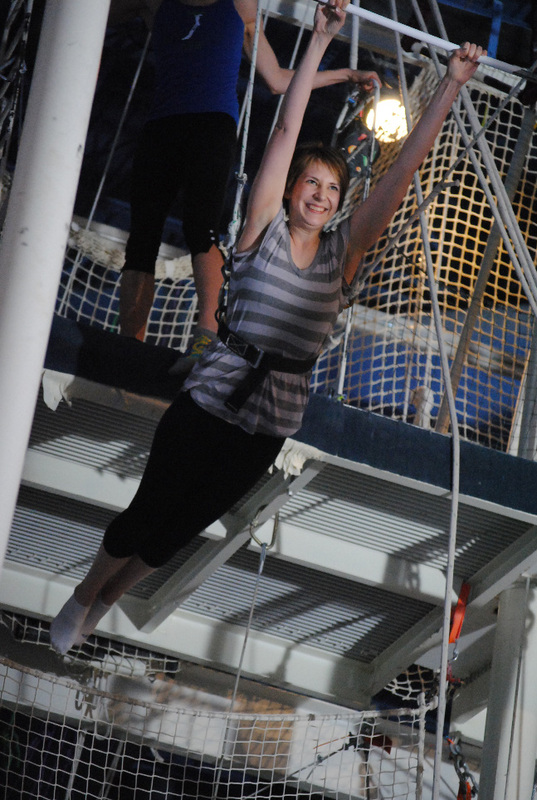 I shouldn’t have been so stubborn because, well, I didn’t like trapeze swinging. So really, what did I have to prove: that I could endure two hours of something I dislike? As silly as it sounds that’s just what I did. I charged up $50 to my debit card and made a follow-up trapeze date with Ms. Stephanie for three weeks from then. Nothing came of Billy, save some photographs he sent me. This was okay, except he sent more pictures of himself, which I found slightly odd. Three weeks came and went and Stephanie and I found ourselves once again in Redding. It makes no sense as I write it but I was more afraid this time around than the last. As in terrified which baffled both Stephanie and the staff. Be that as it may I couldn’t even approach the platform. I was paralyzed with fear on the second story of the stairwell. I let everyone pass me. My mouth grew dry. I defiantly refused to swing. So they tried coaxing and soothing. They ignored me (which marginally worked – I scaled another story). And finally, when it seemed a lost cause Stephanie hit me with a bullet. That’s crafty because I can pretty much be guilted into anything if I’m led to believe I’m cramping someone’s good time. So I begrudgingly approached the platform and grabbed hold of the bars and then… I started to cry. I kept shaking my head and sniffling. All I could recall was the stomach dropping sensation and how much I hated it. I cried because I felt like a big adventure failure. And they weren’t cute, quiet tears. I just cried and cried unconcerned with others opinion of me. I pressed for more details but he said he would say no more until I jumped. So I had to jump. Once airborn I realized it wasn’t as bad as I remembered while still not liking the sensation. Was it worth it? Yes and No. Johann’s story of moving blindly to Boston only to be housed with a random heroin addict prompting him to seek unconventional employment was cute, but that’s not the take away lesson here. Instead, maybe it’s best to know when to hold and fold my adventure fears. I won’t trapeze again. But, should someone ask how I came to try, I may respond with no-nonsense, “heroin”, if only to heighten suspense.